CSXT GO FAST! Rocket. Image Credit: PRNewsFoto/GO FAST! Denver, Colorado. September 4, 2014 – On May 17, 2004 history was made when the Civilian Space eXploration Team (CSXT) completed a successful rocket launch to outer space. 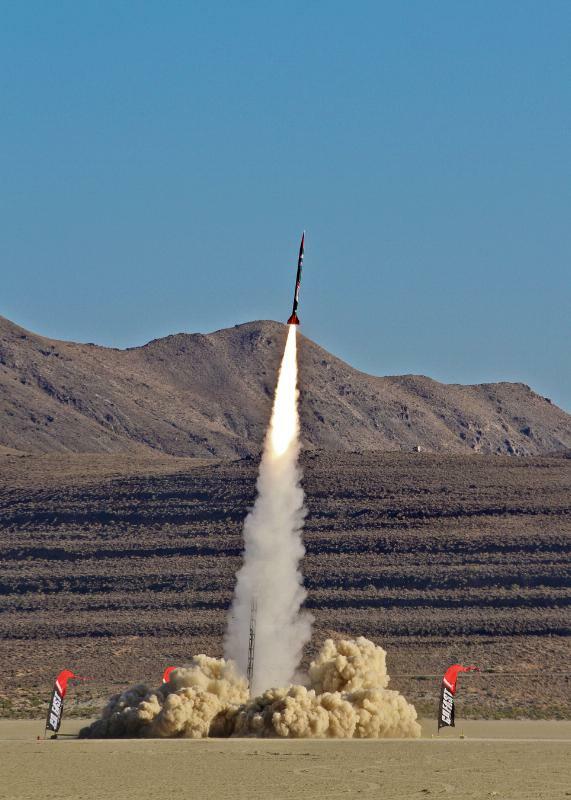 The Space Shot 2004 “GO FAST!” Rocket, which was launched from the Black Rock Desert in Nevada, was the first amateur rocket to exceed 62 miles, the official boundary of space. In fact, this 21 foot rocket reached an estimated 72 miles (379,000 ft) and achieved a speed of 3,420 mph in only 10 seconds. This year, CSXT’s original crew came together once again, and with the help of Denver, Colorado sponsor GO FAST!, they launched another rocket and faced the challenge of breaking their preceding record. Over the years there have been numerous attempts by others to reach this record and/or break it, but none have been able to achieve that goal. 10 years ago the rocket reached Mach 5.5, but this year CSXT was looking to go faster and farther. It took weeks for the CSXT team to locate the CSXT GO FAST! 2014 rocket and recover it, as it landed nearly 30 miles from the launch point. Instruments on board the vehicle held the recorded altitude and speed data which was needed to determine if the previous World Records had been broken. It has now been officially confirmed that the CSXT GO FAST! 2014 Rocket reached 385,800 feet above mean sea level (73.1 miles) and hit a top speed of 3,580 miles per hour, which both qualify as World Records. Along with these two records, the CXST GO FAST! team also accomplished having the first photo taken from space onboard an amateur rocket and now retain the title for being the only amateurs in history to launch a rocket into space. On the day of the launch, GO FAST! Jet Pack pilot, Nick Macomber made a couple of laps around the CSXT GO FAST! Rocket before the launch. A video of that, as well as some raw footage of the rocket launch can been viewed on YouTube at: http://youtu.be/HT7VEq319Go A high definition DVD of this footage is also available upon request. CSXT was founded in 1995 by former Hollywood stuntman Ky Michaelson and is managed by Aerospace Entrepreneur Jerry Larson. The team was formed with the single goal of launching the first all civilian rocket into space. CSXT conducted 3 space shot attempts in the late 90’s and early 2000’s before successfully reaching space in May of 2004. CSXT has future plans to launch a GoFast III rocket beyond 400,000 feet and the long term goal of launching a small orbital rocket into Low Earth Orbit.